Handle user requests for your app's services that originate from Siri or Maps. 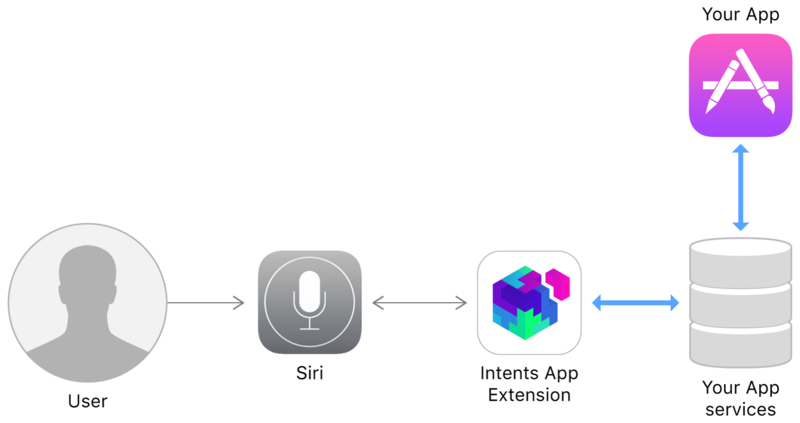 An Intents app extension receives user requests from SiriKit and turns them into app-specific actions. For example, the user might ask Siri to send a message, book a ride, or start a workout using your app. An Intents UI app extension displays branding or other customized content in the Siri or Maps interface after your Intents app extension fulfills a user request. Creation of this extension is optional. SiriKit defines the types of requests—known as intents—that users can make. Related intents are grouped into domains to make it clear which intents you might support in your app. For example, the messages domain has intents for sending messages, searching for messages, and marking messages as read or unread. Your app extensions rarely communicate with the user directly. Siri and Maps typically handle all communication with the user and call out to your extensions only when they need you to provide information. You can provide an Intents UI app extension to customize the information that Siri and Maps display, but doing so is optional. Request permission from the user so that Siri and Maps can communicate with your Intents app extension. Add and configure an Intents app extension in your Xcode project. The Intents app extension provides your response to user requests originating from Siri and Maps. Move your back-end services to a private framework so that they can be used by your app and your app extensions. Provide SiriKit with an object capable of handling a given intent. Resolve, confirm, and handle user requests for your app's services. The interface for dispatching intents to the custom objects that handle those intents. Learn about the classes you use to build your Intents extension. SiriKit groups intents into domains based on the type of app that is likely to support them. Send messages and search the user's received messages. Create and manage notes and to-do list items. Start, end, and manage fitness routines. Send payments between users or pay bills. Initiate calls and search the user's call history. Convey contact and payment information using Quick Response (QR) codes. Search for and display photos. Book rides and report their status. Manage vehicle door locks and get the vehicle's status. Interact with a vehicle's CarPlay system. Create and manage restaurant reservations with help from the Maps app. Common data types such as strings and numerical types are used throughout SiriKit. Manage common data types such as strings, dates, currencies, images, and contacts. Resolve common types of data like strings and dates into specific values that your app recognizes. Identify intents specified by user notifications. Define the app-specific terms that users can speak when making requests through Siri. Register your app's custom terminology, and provide sample phrases for how to use your app with Siri. An object for registering user-specific vocabulary that might be included in Siri requests. Create an Intents UI app extension to customize the interfaces displayed by Siri and Maps. Methods for presenting custom content in the Siri and Maps interfaces. Methods for hiding portions of the default interfaces that Siri provides. A parameter of an interaction object. A Boolean value that indicates whether the app handles Siri requests.